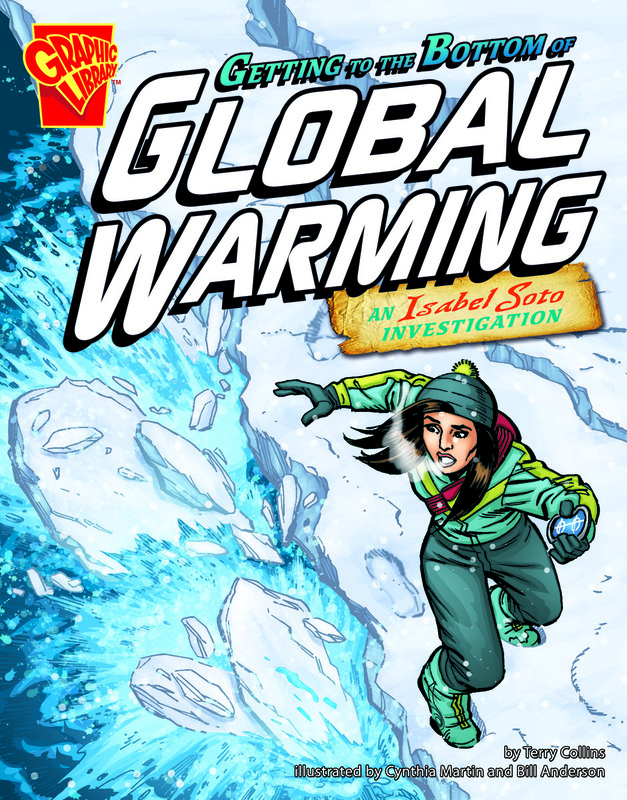 Dr. Isabel “Izzy” Soto, respected historian, anthropologist and colleague of Max Axiom, makes a strong, female lead in her series of graphic-like novels that span the subject matter gamut: investigations into the paranormal, historical events, and other research undertakings. Utilizing a special stone found in Thailand, Izzy is able to travel through space and time to get a well-rounded, multiperspective take on her current area of study. The Global Warming issue is not only timely, but full of adventure. 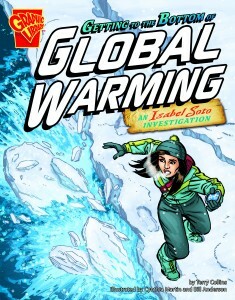 While on a special mission in Antarctica, the good doctor finds herself perilously poised atop a broken piece of an ice sheet. Employing the stone, she transports herself to Greenland – in the nick of time – where she reunites with fellow climate change researchers. As the story progresses, readers are exposed to the theoretical hypotheses scientists of yesteryear held in regards to climate change, most noting it was for the better: warmer weather = better farming opportunities; less harsh winters. All this is done through first hand interviews Izzy conducts with scientists Jean Baptist Joseph Fourier (1800’s), John Tyndall, and Svante Arrhenius (1896). Dr. Soto also looks into the demand for and consequences of fossil fuel usage and sums up our current state, with the development of the UN Conference on the Human Environment (1972), the first World Climate Conference (1979), and the 1990 Intergovernmental Panel on Climate Change. She makes it a more personal, touching issue through a meet and greet with the Shishmaref Village near the Arctic Circle, where homes are crumbling due to thawing ice and erosion and the salmon population is dwindling due to warmer water.